A reflection for the 17th Sunday, Ordinary Time, Year B. The readings are 2 Kings 4:42-44; Psalm 145; Ephesians 4:1-6 and John 6:1-15. What did you bring to Mass today? I’ll tell you what I brought: my insecurities, my doubts, my fears; my frustrations from work this week. I also brought my hopes and dreams and my joys of this week. I brought them so I can offer them up, place them here at the foot of the altar, so that Christ can multiply them, just as he multiplied the loaves and the fishes. Today’s story of the feeding of the multitudes is the only miracle that appears in all four Gospels. In fact, in Mark and Matthew it appears twice in each. So that tells us that it’s important. In John, which is the one we heard today, the miracle happens just before the Passover and it takes place in the same chapter where later Jesus is going to declare, “I am the bread of life.” This is in John chapter 6, in what we call the “Bread of Life discourse”. In fact, this whole year we’ve been reading from the Gospel of Mark, but starting today, for five weeks, we’re going to be reading from the sixth chapter of the Gospel of John. So, it’s like we’re getting the gift of a little summer retreat on the Bread of Life. 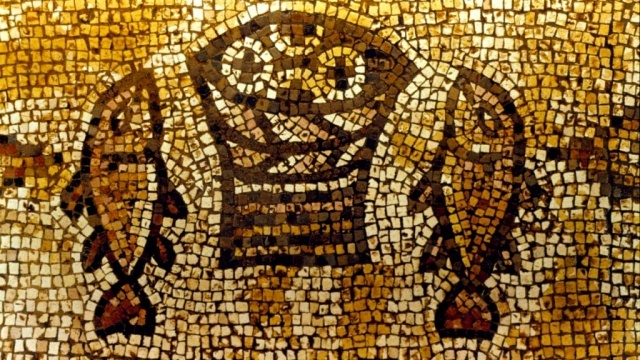 For John the whole Bread of Life discourse begins with this story of the miracle of the multiplication of the loaves and the fish. Except John doesn’t call it a miracle. John never calls miracles miracles; he calls them signs. That’s because John is not concerned with miracles; he’s concerned with what they mean; what they point to. Just like a street sign points to a destination, John’s signs point to a greater reality. This is how we need to read Scriptures and in particular, the Gospel of John. There are lots of signs. And what do these signs point to today? Perhaps we can begin with focusing on the words of today’s Psalm: You open up your hand to feed us, Lord; you satisfy all our needs. Jesus feeds us. And not only does he feed us, but he is the very food that we need. Jesus is all we need. He is our daily bread, the air we breathe – He satisfies all our needs. Jesus fulfils our deepest longings and needs. He satisfies every desire. That’s good news! But there’s more: Jesus can very well feed the crowds all by himself. But he doesn’t. He asks for our help. He asks Philip, “How do you think we should feed these people?” In the other Gospels, Jesus actually tells the disciples, “You, feed them.” Why? Jesus wants us to cooperate with him. Jesus wants us to participate in his saving action. Our Church teaches that everything we receive from God is a gift. We call it Grace. In fact, Grace is the gift of God’s very Life. God gives us Grace; but we have to cooperate with that Grace in order to receive it fully. And we see that in today’s Gospel. And I can think of two responses we can have. We can be like Philip who gets overwhelmed. He gets stuck in the, “Are you crazy? We can’t feed all these people! It’s like a cajillion people and we’d need like a million dollars to feed them!” He gets stuck in the despair. How often do we get caught in the despair – in the “This is impossible; this is terrible!”? In the hopelessness of the situation? Or we can be like the little boy. He offers what he has no matter what. It’s way too much food for a little boy: 5 loaves and 2 fish – but not enough to feed 5000 people – or more – it may have been 5000 men – that’s not counting the women and children! There may have been 20,000 people there. But no matter – here’s my bread and my fish. How often do we get stuck in the “I’m not good enough?” I’m not old enough; I’m not educated enough; I’m not a priest or a deacon; I’m not a theologian; I’m an immigrant; I don’t speak good English? We don’t think we’re good enough and so we don’t offer anything. And how often do we say what we have is not enough? It’s only two fish and five loaves of bread. Not enough, so we don’t offer anything. And did you notice what the bread is made out of? These were barley loaves. Barley loaves were the food of the poor. The rich could afford wheat for bread, but the poor ate barley loaves. So, “ I don’t have alot and it’s food for the poor, but here, you have it.” But sometimes we get caught in the, “oh, I don’t have enough.” Or “what I have is not good enough.” “I only have a can of tuna and some macaroni and cheese and that’s food that goes to the food bank…” So we get stuck in the insecurity, “what I have is not good enough,” and we don’t offer anything. All I have are my fears and my doubts, my insecurities and my frustrations. And I think it’s not good enough. My dreams and hopes, my happiness, my gifts and talents – not enough. But can I bring it so I can offer it, place it here at the foot of the altar so that Christ can transform it as he transforms the bread and the wine into his body, blood, soul and divinity and multiply it. My question to you today is, what are you bringing to your relationship with God? What are you bringing to your prayer life? What are you bringing to Mass every Sunday? Spend time during the week thinking about those things that you want to bring to Mass; your worries. Are you worried about a doctor’s appointment? Are you worried about paying your bills? Did you go to a wedding this week? Bring the joys of the couple, bring your thanksgiving and put it in the basket. Come a bit earlier for Mass and spend some time thinking about what you have to offer. Who are you offering this Mass for? That’s how we prepare for Mass. The offertory is not just about collecting money and it’s not just about bringing the bread and the wine, but it’s so that we bring all our offerings of the week and throw them in the basket. We lay it at the foot of the altar, at the foot of the Cross, so that Christ can transform it and multiply it. It may not be alot – may be a can of tuna and a box of macaroni and cheese – may be only some barley loaves, may be your frustration at work or your concern about paying a bill. It may be a great joy or a great fear. Bring it all. Christ will transform it and multiply it so the world can be fed.